What do you do when you're in the middle of a war zone, helpless with nothing to do about it in a Japanese POW Camp? You lie, cheat and steal against those bleeps who locked you up here. You came to war to fight for your country, not to sit head in hands of defeat from practically day one, so what do you do? Escape. That's what. 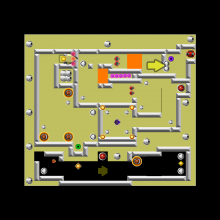 ----- Here's me trying out a differently styled game, minute action games were made a lot in '08 and the early times of Sploder but died out, trying to bring it back a little :D Have fun. Oh, and it's possible, just a tip, use your weapons creatively and only fight when you have to fight. Good luck.